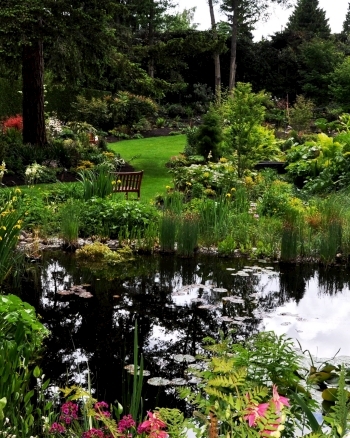 Summer is a great season to visit newly renovated PowellsWood Garden, 430 S. Dash Point Road. The garden will re-open its doors to the public, with a celebration on June 22nd and 23rd 2013. The gate opens at 10:00 a.m. and the garden will remain open until 3:00 p.m. Admission is $5.00, children 12 and under are free. Festivities include exploration of the garden’s summer color, bluegrass and harp concerts, a raffle, and refreshments in the Garden Room. Bluegrass artists Bonnie & W.B. are playing from 12:30 -2:30 on Saturday, and you can enjoy harpist Victoria Norman from 12:00 – 3:00 on Sunday! On site parking at the garden is limited and visitors are requested to take the shuttle from Sacajawea Middle School, just one-quarter (¼) mile east of the garden on S. Dash Point Road. Portland area designer Rick Serazin’s renovations have added additional structure, new vistas, more four-season color, and take advantage of the new plant varieties available to Pacific Northwest gardeners due to a changing climate. So far, the most commented upon new addition has been the Pedyphylum pleianthum hybrid, commonly called a Chinese mayapple, or dysoma. Come and decide for yourself what’s the best new plant of the garden’s collection. Each visitor to the garden during the Re-opening Celebration will be entered into a raffle for 2 free passes to the 2nd annual PowellsWood Storytelling Festival Saturday July 27th 2013. For more information on the Festival see the Storytelling link on our website powellswood.org. The festival is co-sponsored by the Seattle Storytellers Guild. Tea, cookies, and scones will be available for purchase in the Garden Room. A small pot of tea, two cookies, and a scone is $10.00 , tax included. The re-opening marks a return to the garden’s regular open hours of 10:00 a.m. to 3:00 p.m. Tuesday – Saturday through October. I am excited! Can you tell me what time Tori Norman is playing harp? She is incredible. Hi, Russell. We just added the music schedule. Bluegrass artists Bonnie & W.B. are playing from 12:30 -2:30 on Saturday, and you can enjoy harpist Victoria Norman from 12:00 – 3:00 on Sunday!